The United Nations Food and Agriculture Organisation (FAO) says a plague of desert locusts could soon hit several north African states. It says this year's locust swarm looks like being the worst for 15 years. About $9m has been pledged for assistance, but the FAO says more money and resources are urgently needed. 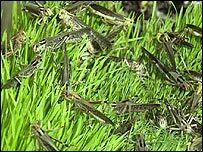 The FAO says the first swarms of locusts have moved from their spring breeding grounds into Mauritania, Mali and Senegal, with many more to come. It issued its first warning of a coming locust plague back in February, when unusually high rates of breeding were detected south of the Atlas Mountains in Morocco and Algeria. Major insecticide spraying programmes were initiated, some funded by western donors, aiming to cut the plague off at source. Clearly they have not worked. The first swarms have now moved into Mauritania, Senegal and Mali, and the FAO says Niger and Chad will also see swarms in the next few weeks. Summer rains have started in the area, which means the insects will lay more eggs as they travel. Swarms could eventually reach the Darfur region of Sudan, where conflict has already created a major humanitarian crisis. Locusts can eat their own weight in food every day, which means a single swarm can consume as much food as several thousand people.